Saturday morning. What’s for breakfast? 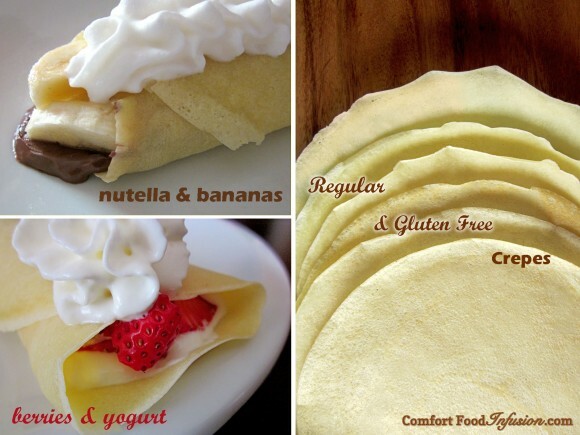 Crepes! If my boys had it their way, this would be a true statement every single Saturday. Actually, it would be Sunday, Monday, Tuesday, Wednesday, Thursday and Friday as well. I don’t think my boys would EVER tire of eating crepes. They absolutely love them with nutella… and sometimes bananas. I like to fill mine is with strawberries, bananas and strawberry yogurt. (My stomach is grumbling at me right now). I avoided eating these for some time, because I cut back on gluten (when I’m being good… and smart). I finally decided to play around with a gluten free version of this. I thought it would be difficult, which is why I waited so long to try, but I had it nailed down on the second attempt. I could have served the GF version to my boys, and I PROMISE, they never would have known. I feel bad tweaking a recipe that is so adored by my family though… like I’m altering the Holy Grail or something. So, I made two batches, and the picture above shows both the GF and the wheat version. Can you tell the difference? Neither could I. I was in Heaven. Get creative with your fillings, and comment below on your favorite. I have never filled mine with savory ingredients, but I would love to hear some suggestions. Images below show the steps to making these fabulous thin pancakes…. 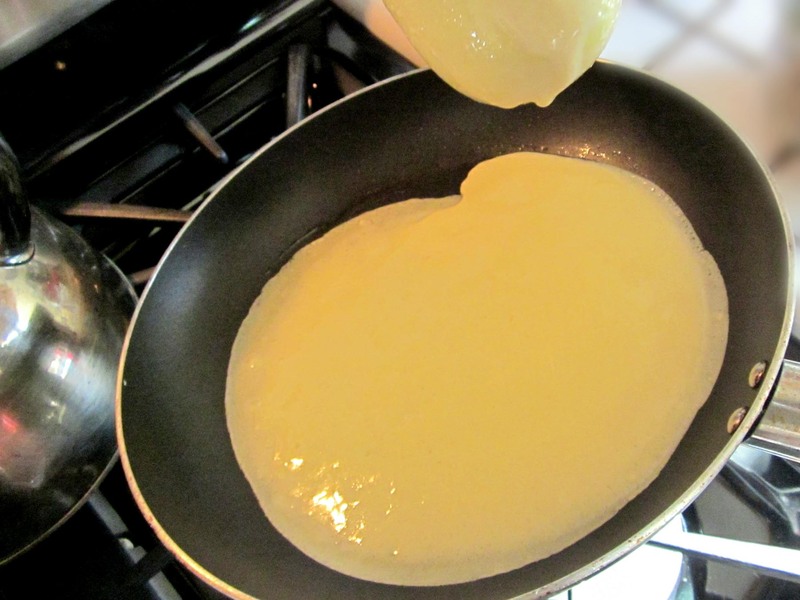 Delicious, super thin, fill-able pancakes. This recipe can be made with gluten free or regular flour. Makes approx. 6 - 9" crepes. In a large bowl, beat eggs and milk well, with a whisk. 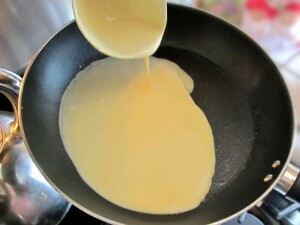 Add the flour, melted butter, sugar, salt and xanthan gum (if using). 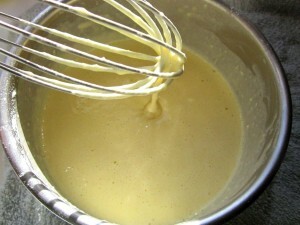 Whisk again, very well until there are no lumps and the batter is the consistency of heavy cream. Heat a 9" pan over medium heat. 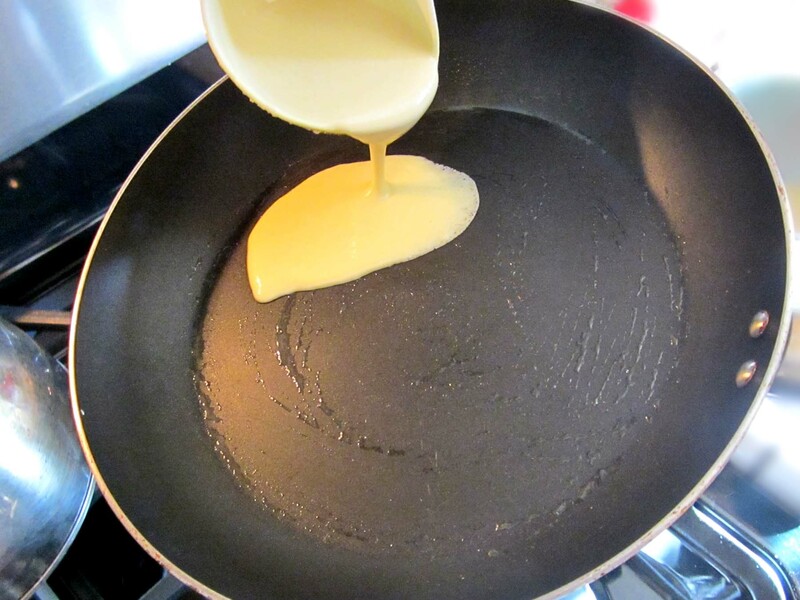 With a pastry brush, brush a little melted butter on the surface of the pan. Fill a ladle with batter. Lift the pan away from the heat, and slowly pour the batter into the pan, while tilting and rotating the pan slowly. Once the batter has evenly coated the bottom of the pan, place back on heat and cook for about 1 minute, or until the batter has dried. Using a large spatula, flip the crepe over. 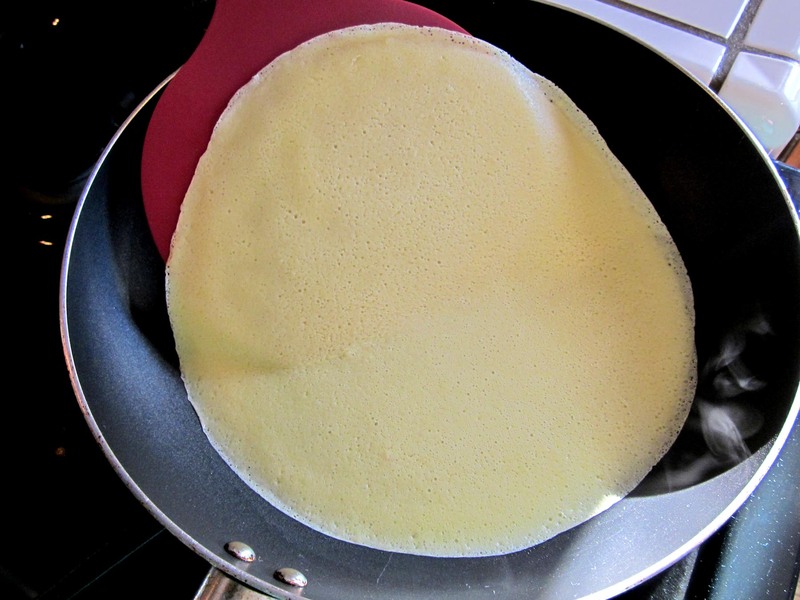 Cook on the second side for about 1 more minute, or until a very slight amount of very light brown appears on parts of the crepe. Remove to a plate and cover with a kitchen towel while preparing the rest. Fill with your choice of fillings, roll up as you would a burrito, and enjoy! It's best to make a large batch, and then measure out your one cup needed for this recipe.